A giant white kitten oozes ruby liquid from its mouth and whiskers. Below the animal is an orgiastic tangle of reclined Rubenesque nudes, some holding chalices to collect the discharge, which splashes and coats their bodies like tomato sauce on human spaghetti. 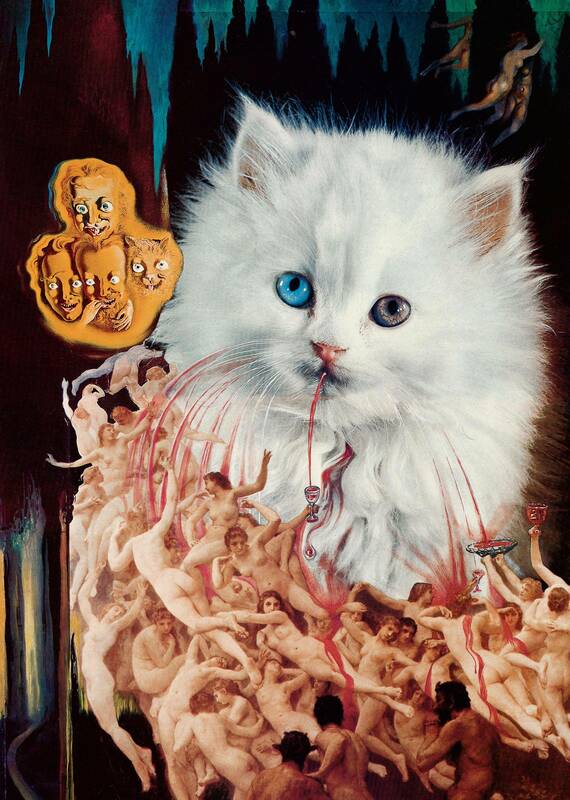 Hovering in the air to the left of kitty's head are four little bug-eyed visages – three men and another cat – staring with menacing smiles like zombie gargoyles over the Renaissance mosh pit. 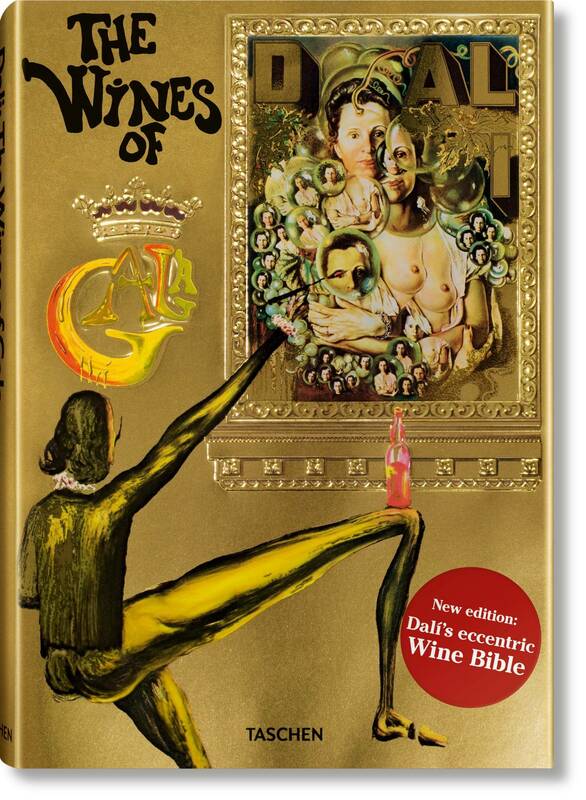 This is what happens when you ask Salvador Dali to write a wine book. The Cat with the Wine-Loving Whiskers is among more than 140 illustrations contained in the Spanish artist's obscure 1977 contribution to the discipline of drinks journalism. The Wines of Gala, published in the long twilight of Dali's career, 12 years before his death at 84, landed with something of a thud in those pre-wine-boom days, eventually falling out of print. Now, art-book publisher Taschen has exhumed it from the cellar. The attractive, coffee-table-sized reissue follows a fresh edition of Les Dîners de Gala, a Dali cookbook originally published in 1973. Both were written in French and dedicated to the eccentric surrealist's wife and muse, Russian-born Elena Ivanovna Diakonova, whom he had christened Gala. As thick-leaf art volumes go, the wine project is a bit of a mongrel. Its core visual attraction is the series of various appropriated artworks in which Dali paints over, or creates collages with, classical nudes and the like. Assembled here also are several untouched reproductions of previous works, including 1955's famous The Sacrament of the Last Supper, his provocative reimagination of Leonardo da Vinci's masterpiece, which serves the book's subject only tangentially by way of a wine tumbler sitting in front of Christ at the table with his hunched-over Apostles. Many of the visuals in fact have zero to do with wine, including dozens of sketches as well as a two-page spread of the famously mustached artist in his studio. And some – notably the various antique grape-cluster prints – are not Dali's work at all save in some cases for a squiggle or two added to the page. Was it tossed off for easy money? If so, I could have suggested a few hundred more bankable pursuits to the genius than wine writing. Then again, he clearly spent little hard time at the typewriter or spittoon. While the title page credits him for conceiving the work, the text was written by two others, Max Gérard, a close friend and collaborator on previous books, and Louis Orizet, a regional inspector with France's appellation protection system (as well as a Beaujolais devotee). In terms of tone, their words do at times mirror the artist's oblique, off-the-wall art. "Wine not only excites our intellectual powers, it creates them," reads one cringe-worthy passage in a chapter titled the Great Red Bordeaux Wines. "Pushing its ethers up to the brain, it invents new synapses and connects thoughts as it links the pleasure of making to that of being made." As it shifts between such abstract declarations, meandering history-essay prose and – what to call it? – drunk-text poetry, it can be a tough slog in places, at least without a bottle of hearty Médoc red and corkscrew at the ready. Divided into equal parts, the book really is two in one, an encyclopedia and a manifesto. 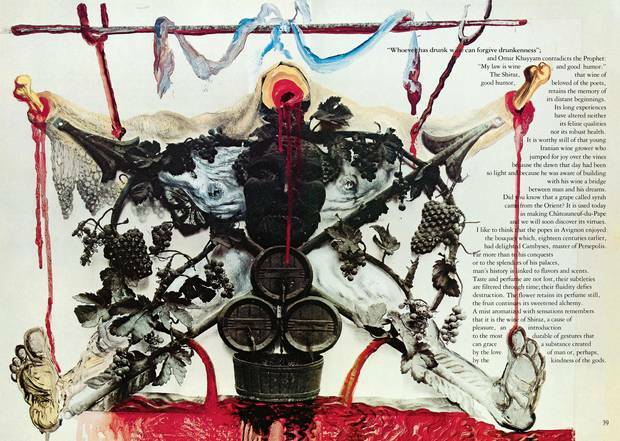 The first half, written by Gérard, is titled Ten Divine Dali Wines and surveys some of Dali's favourite regions and vineyards, such as Bordeaux, the great Burgundy producer Romanée-Conti and Italy's Lacryma Christi. The focus is too narrow (and the writing ironically too rambling) to be considered required reading on a sommelier course, to be sure. There doesn't seem to be much Dali in it, either. 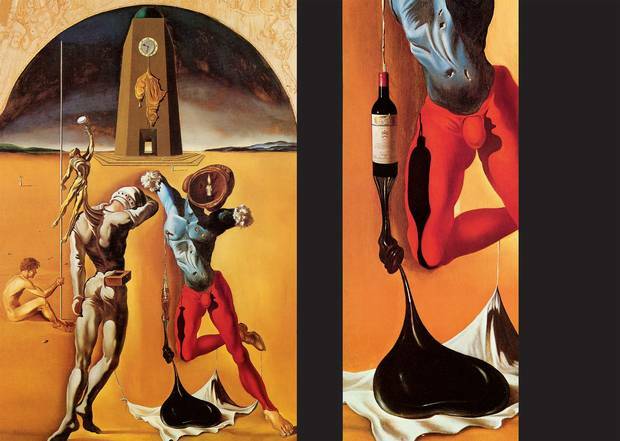 The second, titled Ten Gala Wines, is the glass-half-full part, and where one senses Dali's input more strongly. It sets out to classify wines not by region, grape or crude taste profile, but by emotional impact. As in: Wines of Joy, Wines of Sensuality, Wines of Frivolity and Wines of Generosity. It's also where The Wines of Gala is more likely to stir debate among dorky oenophiles. It's already got me debating with myself. Under Wines of Joy, for example, I can see the relevance of Beaujolais, Valpolicella and vinho verde – crisp, refreshing styles that an au courant wine bar today might helpfully label "cheap and cheerful." But Rioja seems a bit of a stretch. Wine aged for an extended period in heavy American oak is, on my emotional spectrum, poles apart far from happy, fruity-fresh Beaujolais. In the "sensuality" chapter, I would have expected more than the Valentine's cliché of sweetness, as in Sauternes, Barsac and Monbazillac, three French dessert whites. Where are Chablis and Champagne, I wonder, given their reputed affinity with oysters if nothing else? And there are confusing repetitions, as in Chinon and Bourgueil, two Loire Valley reds based on cabernet franc, which appear under both Wines of Joy and Wines of Aestheticism. And yet, there's something inspiring about Dali's classification system. One can disagree with his groupings, but it's the spirit that counts. The book reads like an invitation to apply emotions and moods to your own favourite wine styles and to extrapolate by imagining new categories. This weekend, I may leaf through it again with a bottle from a corner of my cellar where I keep what I now think of as "Wines of Saturday Night by the Reading Lamp." I believe there are a few decent red Burgundies in there. Great balance between rich-supple fruit and savoury characters in this grenache-led blend from a fine producer. Meaty, with a cherry centre infused with lavender, thyme, licorice and black pepper. Approachable now, it should improve with up to 15 more years. Available in Ontario at the above price, various prices in Alberta, $59.25 in Quebec. SCORE: 93 PRICE: $44.99 in B.C. So smooth this could have been polished with a floor buffer. Laughing Stock's impressive 2015 vintage of Portfolio, its flagship merlot-led Bordeaux-style blend, delivers voluptuous cassis, dark-chocolate and vanilla flavours joined by toasty-cedary notes and lots more. A statement wine. Worth cellaring for at least a decade. Available direct through laughingstock.ca. Bone-dry, this is the non-vintage flagship from sparkling-wine specialist Benjamin Bridge. Excellent depth, showing nutty, bready, toasty notes over fresh pear and lemon-lime soda, plus the electric acidity of a mouthful of microscopic spark plugs. Available at the above price in Nova Scotia, various prices in Alberta, $29.99 in Manitoba, $32.95 in Ontario, $29.99 in New Brunswick, $30.25 in Prince Edward Island, $28.96 in Newfoundland. Light and dry, although with a moment of delectable sweetness in the middle to amplify the intriguing pineapple- and lime-like fruit. Available in Liquor Control Board of Ontario stores and through hiddenbench.com. From an excellent producer in Portugal's north-central Dao region, where temperatures stay cool enough to yield some of the country's most structured still wines. A blend of local grapes touriga nacional, jaen, tinta roriz (a.k.a. tempranillo) and alfrocheiro, this red is full and smooth yet fresh, with notes of cherry and subtle spice. A bargain (even at the considerably higher Quebec price). Available at the above price in Ontario, $21.95 in Quebec. SCORE: 90 PRICE: $23.39 in B.C. Piedmont's light-bright dolcetto grape gets the sunny-ripe Okanagan treatment, with more concentration and less bitterness than most Italian examples. Sweet cherry, a bouquet of violets and a trace of leather are set against a mildly tannic backbone in this cheery, unoaked red. Good choice for roast poultry or grilled salmon. Available direct through mooncurser.com. A sturdy blend of monastrell (a.k.a. mourvèdre), cabernet sauvignon and garnacha tintorera (a.k.a. alicante bouschet) from Yecla in Spain's southeast corner. Generously fruity yet firm, it's like plums and blueberries coated in black licorice. A satisfyingly dense mid-palate tightened up with dry, chewy tannins. Perfect for lamb, whether roasted, grilled or stewed. Available at the above price in Ontario, various prices in Alberta. This is made from saperavi, a signature red variety of Georgia (the country), and it exhibits a grapy, come-hither profile that should please fans of value-priced Argentine malbec. Fresh berries enveloped in forest aromatics, with slightly sticky tannins lending structure. Available in Ontario.